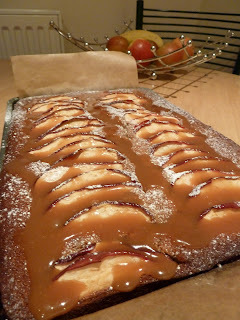 As soon as I saw the Autumnal Baking Challenge & Giveaway at What Kate Baked's new bloggy home I knew I had to enter! Autumn and winter are my favourite times to bake, because of the weather and also because the bakes and flavours of these seasons are what I like to eat the most! I sort of ended up baking two different things for this challenge... both of which I will include in this post but the second one is the real entry! I will explain... I started to get my thinking cap on and thought of what a truly autumnal bake would be to me. I thought of apples, toffee, and warming spices like cinnamon. I thought of something chunky to get stuck into while curled up on the sofa with a cup of tea. 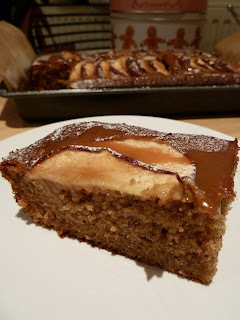 So this recipe on BBC Good Food for Caramel Apple Loaf Cake seemed perfect and I set about making it. 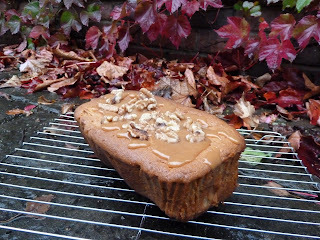 Everything was going to plan and I was so smug and confident that I had found the perfect Autumnal bake that I took it into the back yard in the drizzle and took some photos of it with the leaves! Doesn't it look pretty? For any readers of Good Food magazine this will be no stranger as it is this month's cover recipe. As soon as I saw it I knew I was going to make it anyway (and to be honest I don't know why I faffed about with bloody loaf cakes to begin with!). 1. Preheat oven to 180c / gas 4 / 160c fan over, and grease and line a 20x30cm baking tray. 2. Put the dates and milk into a pan, and bring to a simmer. Leave for about 15 mins to cool, then put into a blender or food processor and blend to a paste. 3. Put the date/milk paste into a mixing bowl then add the butter, flour, brown sugar, baking powder, eggs, mixed spice and vanilla. Set aside. 4. Quarter and core the apples and slice thinly, adding the lemon juice. 5. Then beat together the cake ingredients until smooth, and tip into a baking tray. 6. 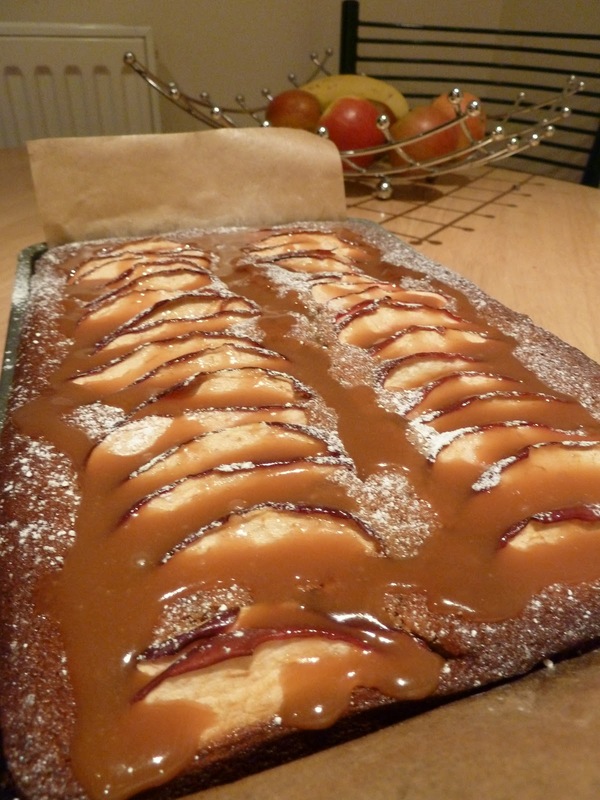 Put the apple slices in rows overlapping on the top of the cake - you should fit 2 or 3 rows lengthways. 7. Bake for 45-50 mins - test with a skewer, if it comes out clean the cake is ready. Cool in the tin. 8. Melt the toffees gently in a pan with a splash of milk, stirring, until runny. Dust the cake lightly with icing sugar then drizzle the toffee sauce over the cake. 9. Make a cup of tea, slice the cake into squares, and devour! Mmmmm Autumnal goodness. This is probably one of my favourite recipes I've made, it tasted a bit like cakey gingerbread and had a definitely kick to it with the spice. Definitely best eaten warm from the oven, but I also think it would also have been yummy with a big dollop of custard. I took most of it into work and one person said, "Mmmm this is just the thing now the weather's turned" - so a definite Autumnal baking win I think! Thanks Kate for a great challenge, can't wait to see all the other Autumny bakes! That melting layer of toffee is making my mouth water! Loaf cakes can be funny, I have a tendency to skewer test them to within an inch of their life! I always find that they need a layer of greaseproof paper on top so that the inside keeps cooking and the top doesn't burn. Wow that tray bake looks delicious - can I have a slice!!! Thank you so much for this absolutely delicious entry Kim! I love the sound of spiced apple toffee cake. Its a shame the caramel apple loaf didnt work out, it still looks good.